Top 10 Literary 'Hero' Resides Here! For such an acclaimed classic novel, I've come to it late. 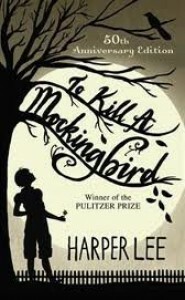 I know the the reputation of the masterpiece by Harper Lee and the centrality of the character, Atticus Finch. What I hadn't realised was that it's written from the perspective of his young daughter, Jean Louise, aka 'Scout' and I think this was a masterstroke. Atticus is heroic because he acts as the conscience of the community of Maycomb, Alabama, albeit he is impotent in the face of 1930s racism. Nonetheless, Atticus represents the rule of law and advocates for justice via the courts and crucially he has imbued his children with the ideals of what is right. And it is the naive belief of his children, unencumbered by the subverting effects of the prevailing white adult culture, which seizes the imagination. Throughout the book the invisible spectre of Boo Radley (local recluse) looms large for Scout and her brother (Jem), but so does the presence of their 'coloured' cook (Calpurnia) and as a consequence it is the simply balanced view of Scout, which deftly marshalls the sympathies of the reader. A remarkably well written book, which continues to stand the test of time.